Recognize when your client's desire to be "healthy" has become unhealthy. The concept of "healthy eating" appears to be our new cultural fixation. We are inundated with articles and advertisements promoting costly juice cleanses, clean-eating recipes, and lists of alleged "superfoods" all claiming that they hold the key to optimal health and vitality. Traditional diet plans, such as Weight Watchers or Jenny Craig, have decreased in popularity over the years and are being replaced by the emerging trend of eating unprocessed, organic, whole, and natural foods. While there is nothing wrong with trying to incorporate more whole foods into one's meals, it is important to note that all foods eaten in moderation can be part of a healthy diet. Additionally, when the preoccupation with healthy eating is taken to the extreme, it can begin to wreak havoc on an individual's mental and physical quality of life. Carolyn Costin, MA, MEd, MFT, a psychotherapist, coauthor of 8 Keys to Recovery From an Eating Disorder: Effective Strategies From Therapeutic Practice and Personal Experience, and the founder of Monte Nido and Affiliates, discusses this paradox when she says, "In today's world healthy eating is promoted everywhere. People are praised for making 'healthy' choices even when they are doing it to their detriment. Most people get reinforced for making 'healthy' food choices until their physical or emotional state is severe and, even then, praise can continue to come from people who do not understand the situation." In today's health-obsessed society, it can often be challenging for social workers to determine what is behind their client's newfound desire to pursue healthy eating. It is important to be aware of what warning signs might indicate that your client's wish to pursue optimal health has developed into an eating disorder. This awareness is valuable to improve prevention, early identification, and treatment for an emerging eating disorder, orthorexia nervosa. "Orthorexia nervosa" is a term that was coined by Steven Bratman, MD, in 1996, used to define "an unhealthy obsession with eating healthy food" (Bratman, 2014). The term "orthorexia" is derived from the Greek "orthos" meaning "right" or "correct" (Bratman). Bratman devoted his time to studying the condition following a personal struggle where he developed a fixation on healthy eating (Bratman). While orthorexia nervosa is not currently recognized in the DSM-5, it has garnered recent public attention due to the significant impairment that it can have in an individual's functioning, as well as the widespread belief that it is becoming more prevalent. Diane Ryan, LPC, MA, CPT, executive director of Mirasol Eating Disorder Treatment Center, says, "I have a sense that it probably is more prevalent. I think certainly that the interest in nutrition and obesity drives a lot of that. The way the DSM-5 has categorized things, there is a little more of a focus on that. If you have the underlying psychological conditions that sets you up for any kind of emotional challenge, you might be very likely to fall into something like orthorexia." There are myriad studies that support the significant role that genes play in the development of eating disorders. Furthermore, research suggests that a variety of environmental stressors and factors can serve to bring out the underlying genes for individuals who go on to develop eating disorders (Mazzeo & Bulik, 2009). Like other eating disorders, orthorexia is likely caused by a combination of a genetic predisposition and environmental stressors. Additionally, while the external motivation for an individual struggling with orthorexia appears to be "health," there are often underlying motivations, such as a desire to feel a sense of control, wanting to be thin, looking for a form of identity, searching for a sense of spirituality, or attempting to escape from feared health outcomes (Kratina, 2006). It is critical to recognize some of the red flags that could indicate that your client's interest in pursuing health is causing them to develop an unhealthy obsession. 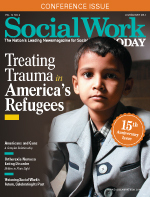 As social workers, it is important that we educate ourselves on this issue so that we can connect individuals who are struggling to appropriate treatment and support. The following are warning signs that many experts agree may indicate that your client is currently, or at risk of struggling with orthorexia nervosa. • Major changes in a client's weight or dietary patterns. Anytime a client loses a significant amount of weight or makes major changes in their dietary patterns, it is important to notice and investigate further. When it comes to someone who is struggling with orthorexia, Ryan has found that "if you are able to observe their food choices, it is going to be apparent quite easily that they are cutting out food groups. For instance, I hear a lot of clients that say, 'I don't eat anything that's white.'" Further, individuals who are experiencing orthorexia may start out by making one dietary change or restriction; however, typically their list of "off-limit" foods becomes larger over time. Ryan explains, "Often it expands. So you start out eliminating a few things and then because of the way that it makes you feel, you continue to eliminate more and more." Additionally, while weight loss (in combination with other factors) may seem like a bright red flag that an individual is struggling with an eating disorder, it is important to note that people with eating disorders come in all shapes and sizes. There is a popular misconception that an individual who is struggling with an eating disorder always appears emaciated; however, the reality is that you cannot determine a person's level of suffering on the basis of their weight. Thus, it is crucial to look for a combination of numerous warning signs of an eating disorder as opposed to making an assumption based solely upon weight. • Rigidity in eating behaviors and food choices. Eating disorders are often characterized by rigidity specifically with regard to the development of food rules and rituals that invoke extreme guilt if "broken." Therefore, it is important for social workers to ask further questions when clients begin to talk about food rules or feelings of guilt in relation to eating. Allison Puryear, LCSW, CEDS, a psychotherapist and certified eating disorder specialist, says, "Often individuals with orthorexia are less concerned about the more traditional diet markers like carbs, fat grams, [and] calories, and more concerned about whether something is a whole food, unprocessed, organic, locally grown, raw, etc. They'd be more likely to eat a higher calorie, higher carb, higher fat gram food than someone with anorexia, for instance, as long as it fits the criteria of their orthorexic rigidity. However, this is not to say that someone who really likes kale has a problem. Like any diagnosis, it's only a problem if it's impacting their well-being." Costin says that she looks at the concept of a position vs. a preference. For instance, someone can prefer to eat a lot of fruits, vegetables, and whole grains. However, if none are available at a particular meal, it's important to look at whether they would be able to eat the other foods that are available. She discusses how it is important to look at the client's level of rigidity in terms of their thinking and behavior, as well as the extent of their limitations. Therefore, one way to determine whether the individual is making a choice based on a preference or is exhibiting warning signs of an eating disorder is to examine their level of flexibility with regard to food. According to Costin, a helpful question to ascertain this is, "Is the client able to eat other foods in circumstances where their 'healthy' foods are unavailable?" In other words, when your client finds himself or herself in a situation wherein they cannot eat what they deem healthy foods, do they react with anxiety and become emotionally unstable, or can they simply go with the flow? • Avoiding social events due to available food options. Part of what makes eating disorders so devastating is that they are truly disorders of isolation. When an individual is intensely struggling with an eating disorder, it often becomes their main relationship. Additionally, it can be difficult for people with eating disorders to be in situations where they are unable to exert control over their food choices. Therefore, another warning sign that your client might be struggling with orthorexia is if they begin to avoid social events due to concerns about the quality or type of the food that will be available. Costin discusses this when she provides an example of a client with orthorexia that was invited to go on a camping trip and makes the decision that they would rather not go because they didn't want to eat the food provided as they did not deem it as healthy and it did not meet their rigid rules. Over time, this could lead to the client deciding to avoid social events altogether and may cause them to become isolated from friends and family members. • Speaking about "purity" and "spirituality" in conjunction with food. Individuals with anorexia often talk about a desire to be "thin" or lose weight, whereas those who are struggling with orthorexia may speak about wanting to feel "pure," and "healthy." Ryan exemplifies this point when she says, "They probably will speak more about purity and spirituality in conjunction with food is a way that might be noticeable. Orthorexia is largely about feeling righteous. It's about feeling that for instance, because I don't eat these things and do eat these things, I am better. If I eat this way, then I can have a good day. I'm a good person and I am in control." Brooke Farrington, MSW, LCSW, CEDS, a therapist, certified eating disorder specialist, and the director of Farrington Specialty Counseling Inc., explains, "Like many have faith in God, those with orthorexia place faith in the idea of pure eating. There is also the aspect of 'the body is a temple,' which can be taken to an unhealthy extreme." • Increased focus on food. As with other eating disorders, individuals with orthorexia typically will demonstrate an increased fixation on food. This often presents as an obsession with different types of ingredients, times of day to eat, quantities of food, and food preparation (Bratman). If you notice that your client appears to be preoccupied with thoughts about food, it is important that they are evaluated to determine if they might be struggling with orthorexia or another eating disorder. Judy Scheel, PhD, LCSW, a psychotherapist and author of When Food Is Family: A Loving Approach to Heal Eating Disorders, discusses how individuals with orthorexia often find lots of support and validation for their fixation on food due to our cultural obsession with diets and "healthy eating trends." Scheel says that these alleged "healthy eating trends" might involve components such as "fasting, being overly concerned with ingredients, avoiding or overconsuming certain foods, or 'cleansing.' This reinforces the thinking of someone with orthorexia, as they are less likely to see the problem in their own eating patterns." There are some unique barriers present when it comes to treating individuals who are struggling with orthorexia nervosa. For instance, the diet and health-obsessed culture in which we live can be a challenging climate for an individual who is working towards recovery from orthorexia. Also, for individuals in recovery from orthorexia there are endless environmental triggers. Today's society not only is obsessed with the idea of physical perfection and the "ideal body" but also heavily encourages the behaviors that those with orthorexia are often using to hurt themselves. This can be challenging for clinicians, as the client is often bombarded with messages that may contradict what is helpful in regards to their recovery. Puryear explains that another challenge is that "many people don't take orthorexia seriously. One end of the spectrum sees it as silly to pathologize healthy eating, whereas the other believes it's a conspiracy by Big Pharma to keep us all sick and dependent on their medications." Further, due to the cultural pressures, as well as validation that they may receive from others, individuals with orthorexia may have difficulty recognizing that they need to seek treatment. Denial is often an integral component of eating disorders and this may be even more pervasive for those with orthorexia, as the illness that they struggle with is often so positively reinforced. Farrington says, "I was seeing a client whose physician actually sought advice from them. Also, there is always research that these individuals can cite to back up their opinion. This is one of the biggest challenges in treating this population." If you suspect that your client might be struggling with orthorexia, it is important that you take the necessary steps to ensure that they receive appropriate evaluation and treatment. Puryear says, "Eating disorders are the most deadly mental health diagnosis. If you don't know what you're doing with them and don't like working with them, please refer out to someone who does. If you aren't sure if what you're doing is best practices and really like the eating disorder population, please get supervision or consultation." Additionally, when treating individuals with eating disorders it can be highly beneficial to utilize a multidisciplinary team, such as a psychiatrist, nutritionist, therapist, or physician. However, it is critical to ensure that members of the treatment team are also knowledgeable about working with individuals who have eating disorders. "The person is at risk for not only psychological issues but serious medical ones as well. Research indicates that many people with diagnosed eating disorders had a predisposing depression or anxiety prior to the development of their eating disorder. Therefore, psychiatric intervention may be appropriate, as medication could be necessary," Scheel says. Furthermore, when working with individuals who have eating disorders, it is important for clinicians to examine their own biases that could impact the treatment provided. For instance, it is critical that clinicians working with this population do their own "work" in regards to their views on weight, health, and body image. Even among eating disorder clinicians, weight-stigma and diet-mentality exists. Therefore, it is important to examine and challenge one's own biases towards individuals on the basis of their weight or eating habits. Working with individuals who have eating disorders, including orthorexia nervosa, can bring unique challenges; however, it also can be incredibly rewarding. Ultimately, as social workers it is important that we are aware of our areas of specialty and limitations, so that we can ensure that our clients receive appropriate treatment. When working with clients with orthorexia, it is important to emphasize that full recovery is possible. No one chooses to develop an eating disorder; however, they can choose to work towards recovery at any time. With access to appropriate intervention, treatment, and support, individuals with orthorexia can recover and go on to live productive and meaningful lives. — Jennifer Rollin, MSW, LGSW, is a mental health therapist, intuitive eating counselor, and blogger. She specializes in treating adolescents, survivors of trauma, and individuals with eating disorders and mood disorders. Bratman, S. (2014, January 23). What is orthorexia? Retrieved from http://www.orthorexia.com/what-is-orthorexia/. Kratina, K. (2006). Orthorexia nervosa. Retrieved from https://www.nationaleatingdisorders.org/orthorexia-nervosa. Mazzeo, S. E., & Bulik, C. M. (2009). Environmental and genetic risk factors for eating disorders: What the clinician needs to know. Child and Adolescent Psychiatric Clinics of North America, 18(1), 67-82.